LDRNL | Mainline Conveyor Systems, Inc. 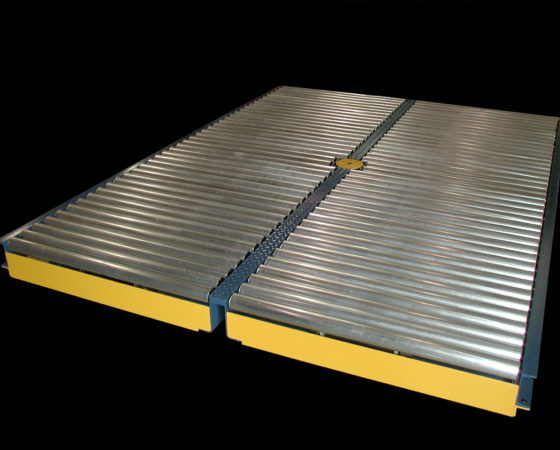 The Non-Lifting Load Roation Device (LDRNL) is a special device that reorients a unit load on the conveyor. The rotation device itself consists of a pair of self contained conveyors, arranged side by side, with a pivot assembly mounted between them. The conveyors can be built as the standard center belt, belt driven live roller conveyor or as chain driven live roller conveyors. The pivot assembly consists of a plate attached to a post that is supported by bearings for rotation. The bearings, post, and plate are all supported by an air actuator that raises the unit to engage the load bottom during rotation. During normal conveyor operation, the pivot assembly remains in a lowered position as the paired conveyors operate in tandem to move loads over the conveyor. When a load is to be rotated, it is stopped and centered on the conveyor just over the pivot plate. The air actuator below the post raises the pivot assembly to engage the center of the load with a slight pressure to maintain contact with the load without slipping during rotation. The paired conveyors engage the load in opposite directions causing rotation of the load about the pivot assembly. A sensor, attached to the pivot assembly, tracks the degree of rotation and thereby controls the rotation in the desired increments.